In just a few short weeks, the Ray Aviation Scholarship chapter application will become available, providing chapters with the opportunity to apply to take part in the program. Following the chapter application process, qualified chapters will be able to bring forward recommended scholars. Even though the chapter application is not open yet, chapters can still take some time to prepare for the program. Just like the Young Eagles program, chapters must appoint a program coordinator for the Ray Aviation Scholarship program. Now is the time to appoint this individual, as there will be specific qualifications and duties for this coordinator, such as submitting the chapter’s application. Click here to learn more about the scholarship coordinator position. Although chapters are not guaranteed a scholarship slot and candidates are not guaranteed an award, it is still important to know what is needed for a student to apply. Applicants should have the following on hand when they fill out the application with the chapter’s scholarship coordinator. Digital copy of FAA medical certificate (private pilot only). Digital copy of student pilot certificate. If completed, a digital copy of their FAA written exam score sheet. A short essay (150-200 words) on why they believe they should be selected as a Ray Scholar. Please remember to not imply to prospective scholars that they will be receiving a scholarship — simply help them prepare to apply. If approved to administer the Ray Aviation Scholarship, chapters should ensure that potential scholars are aware of the time commitment this scholarship will entail. 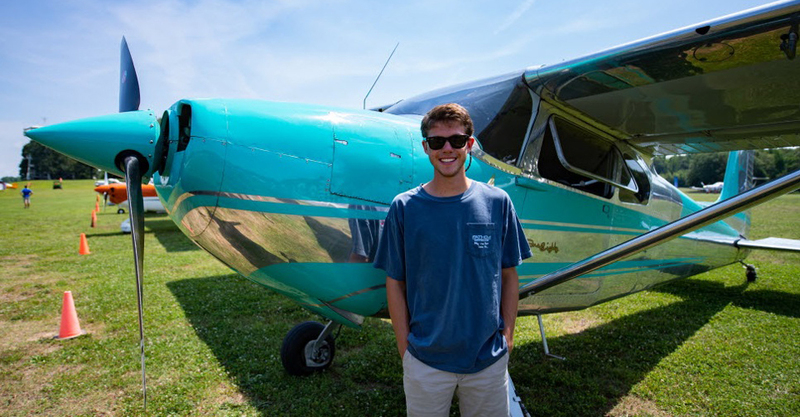 From flight lessons and at-home study to chapter volunteer work, it may require an adjustment of the applicant’s current routine if they receive a scholarship. Parents of potential scholarship winners, especially applicants under the age of 18, should be made aware of this potential flight-training award. Getting mom and dad’s buy-in will be extremely critical to the success of the scholars. This step can occur once the chapter has been qualified as a Ray Aviation Scholarship chapter. It should be made clear to parents that successful flight training requires an exceptionally high level of dedication. Flight training is not simply arriving to the airport three times a week for a two-hour lesson. In addition to flight lessons, there will be at-home study and chapter involvement. This may require the student to step away from other commitments, allowing them more time to focus on flight training. Making the parents aware of this possibility early on will help them ease into a new routine with their child. Bring the parents out to the airport. Give them a tour of the chapter facility, flight school, FBO, member hangars, etc. Show them what a fun world aviation is so they can begin to understand the possibilities surrounding their child’s successful completion of flight training. Aviation is a great unknown to many people; now is the chapter’s opportunity to bring visibility to this fantastic world. If you have any other questions about the program, visit EAA.org/rayscholars. Here you will find educational webinars, FAQ, and eventually the chapter application.